The perfect location to discover the region of Savoie, Les Brasses combines the excitement of downhill slopes and cross-country trails with the tranquillity of a traditional Alpine village. 30km of slopes from beginner to expert are just waiting to be conquered. Close to Geneva and Annemasse, it’s ideally placed for easy access and exploring the wider area of Rhône-Alpes. There are so many different things to do in Les Brasses for the whole family. Dog sledding is a great way to get to know these majestic animals better whilst enjoying a tour of snowy Plaine-Joux in traditional style. Visit nearby Bogève to arrange an excursion. For those that prefer to set their own pace, a pair of snowshoes gives access to experiences like an igloo construction workshop. Kids can build their own icy home then refuel with some toasted marshmallows. Or visit a whole village of igloos and enjoy French specialities like fondue and Comté pears. Adults and children over nine years old can even stay in this unique setting in the nearby region of Onnion. Living in Les Brasses is fun, relaxing and full of entertainment. All the local establishments are warm and welcoming. Visit a friendly café for drinks, a bite to eat and some live music. In summer, bands play outside. There are events held several times a week, all year round. A travelling cinema rolls into town four times a month with a range of films, many of which cater to younger viewers. There’s also a French Ski School based at Masif des Brasses where learners of every level are catered to. 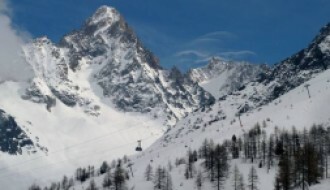 According to the annual snow report Les Brasses has around 20 days of snow a year, with the season running from December to the end of March for around 100 days of top Alpine skiing. 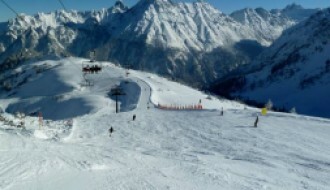 For up to date snow and weather reports, take a look at our Les Brasses resort guide. It’s hard to mention Les Brasses and not talk about the stunning 13th-century Chateau de Beauregard. This fairy tale castle is illuminated at night, making it a charming landmark and a fantastic place to explore during the day. Events here include ‘Knights of the Lost Castle’, which allows kids to dress up and let their imaginations go wild. Organic producers help kids learn about where their food comes from. With a focus on organic agriculture, they sell seasonal baskets of delicious produce, either direct from the farm or at various nearby markets. On Saturday mornings, you can find stalls outside local boulangeries. For more outdoor fun, take the family to a milk farm and meet some friendly goats. Pet the animals, get involved in milking, and stock up on some amazing cheese. Art lovers should head out onto the Plaine-Joux Plateau and take a closer look at the marble and limestone boulders. Many of them are carved with unusual and striking designs, thanks to the work of four sculptors who spent a whole day striving to capture the inspiring elements of the local landscape. Investors buying a property in Les Brasses will be pleased to know that the area’s properties echo the Savoie Alpine charm in both architecture and amenities. A four-bedroom chalet nestled at the foot of the Onnion hills may be ideal for both family life and access to the slopes. Or maybe a converted traditional Savoyard farmhouse with the opportunity for even further renovation is a more tempting investment. Les Brasses is considered by many as a place to ski, nurture the family and, most importantly, to relax. It’s a popular destination without being overrun even at the peak of the season. New investments keep the resort fresh and up to date, such as the 2018/2019 season covered moving carpet for the beginners' area replacing the old rope tow. There were also two new freeriding zones recently added, greatly increasing the appeal of Les Brasses to a more diverse range of skiers. Les Brasses enjoys summer temperatures around the mid-twenties and plenty of hours of sunshine. August 2018 saw 276 hours of sunshine, so plenty of opportunities to get out and about and explore the breath-taking Alpine scenery. 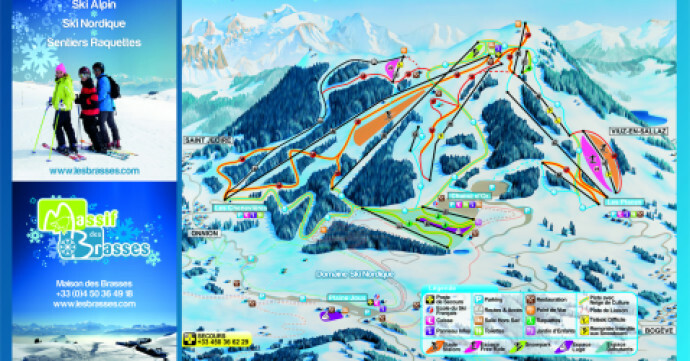 For up to date weather and snow reports, take a look at our Les Brasses resort guide here. Les Brasses is less than an hour’s drive from Geneva airport. Shuttles are in place, and taxi services are also available. 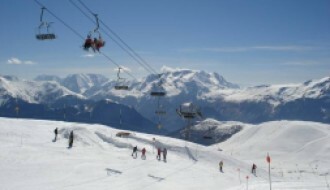 For the surrounding area, free shuttles are often available during the school holidays to ferry skiers from Onnion to Bogeve and other nearby destinations. There’s also a local public transport network. Look for the number 102 bus which travels to Viuz-en-Sallaz and Saint-Jeoire. The station at Massif des Brasses has contacts for many local emergency services and support networks. This includes everything from text services for the hard of hearing to the details of physiotherapist for those that have overdone it on the slopes.